Improving today’s energy mix towards a more diversified and sustainable one is a cause that generates a lot of support because it helps us fight climate change. Both challenges cross frontiers and rank high with most Europeans because they affect our standards of living and our economic growth. They require international collaboration, wide expertise and the development of new skills. This was the spirit of the second Franco-Spanish industrial meeting, which managed to attract the interest of more than 50 companies with a proven-track in the field of nuclear energy. 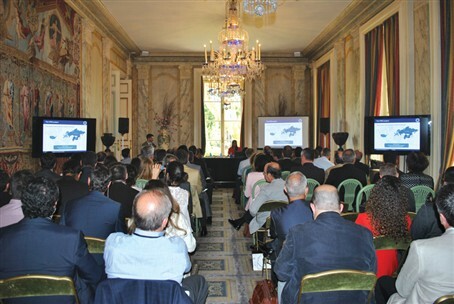 Building on the success of a similar event organised almost two years ago, Spain’s Industrial Nuclear Forum and the Business Division of France’s Embassy to Spain collaborated once again. The main objective of the meeting was to bring together different economic actors so as to network, establish new partnerships and discover the different commercial opportunities stemming from big energy projects like ITER. Both countries score high in terms of contracts signed, suggesting an impressive involvement of companies as main contractors or subcontractors, in the fields of construction and manufacturing of components. On behalf of F4E’s Market Intelligence Group, whose main task is to scan meticulously the market, identify and facilitate the participation of companies from over all Europe, Anthony Courtial offered a detailed overview of the progress so far and of the various contracts in the pipeline. Several business meetings were also organised, giving companies the possibility to liaise directly with F4E, in order to understand how they could potentially contribute to the ITER project. Overall, the second edition of this event was considered a success because of its commercial focus and its cross-national setting.